Kustodievsky merchant – the artist’s memories of the past life – well-fed, prosperous, stable. The merchant from the master is huge, full, full. A heavy fur coat with a rich collar, an expensive astrakhan hat, and a rich, well-groomed beard are not random details. Before us is a successful trader, thorough and resourceful. Such people were the backbone of Russia, the foundation of its economic prosperity. The look of the merchant is very energetic and lively, which contrasts with the obese figure of the hero. An unusual mobility, a sharp mind, a grip are felt in the look. The appearance of the merchant is deceptive. It is only at first glance, he is clumsy, lazy. In trade, his pressure and commercial talent are very active and energetic. The background of the picture also says a lot. Shopping arcade, tavern, church. All these are the three components of the Russian merchant life. Full, powerful Russian land behind the merchant. A warm fur coat, smoke by a column from a pipe of a tavern – create an atmosphere of coziness, comfort, stability. It is not by chance that the artist actively uses blue and blue colors. They emphasize not only the frosty winter weather, but also the nostalgia of the author for the time left. 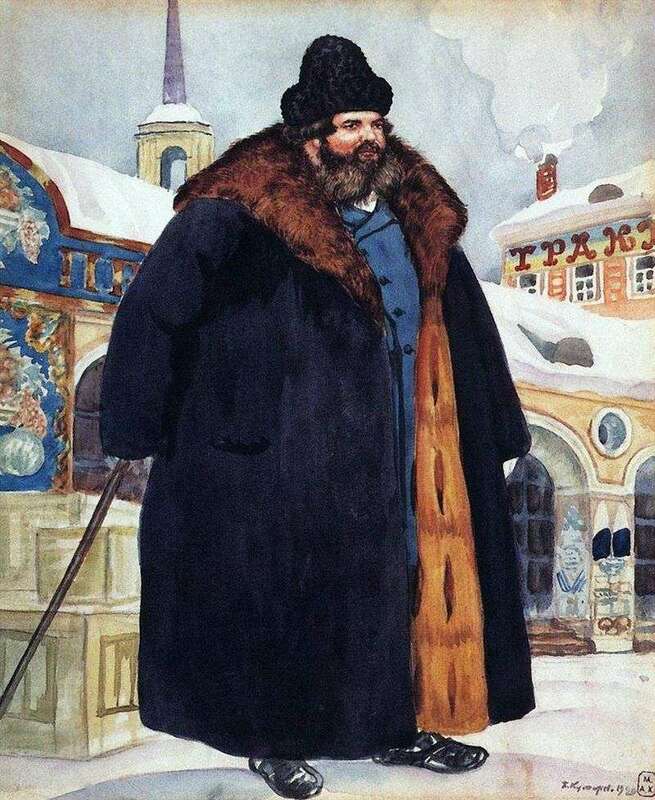 Description and meaning of the painting A merchant in a fur coat by Kustodiev.